When Carpenter Elementary School parents meet with Chicago Board of Education President Michael Scott this afternoon (Thursday, March 19, 2009) at 3:00 pm to discuss the community and parent objections to closing down Carpenter and using the Carpenter building for something called "Ogden High School", the question will be how far Scott's charms will go to prevent the Carpenter community from continuing its militant opposition to the destruction of their school. Scott has been defusing community protests against the policies of the Daley administration for seven years, usually simply invoking the executive power of the Board against the organized opposition. When the school on the hit list has low test scores, Scott usually repeats a well-rehearsed slander: "Parents just won't admit when their school is failing." Rather than acknowledge the complexity of evaluating real schools (and, usually, parental concerns about security and other factors), Scott has simply repeated the talking points of the Daley administration, helping to destroy more than 40 public schools since he first teamed up with Arne Duncan on these projects in 2002. Most of those schools have been turned over to private operators, like North Lawndale College Prep Charter High School, which currently occupies the Collins High School building in Scott's own home community of North Lawndale. In the war against public schools in Chicago, Michael Scott has heaped up the second largest body count of public schools destroyed and privatization and gentrification furthered. Only Arne Duncan has a more thorough record, and that is because Scott left the Board of Education for more than two years to seek (and make) his fortune as a Chicago real estate developer. Facts and costs never stopped Daley administration's juggernaut for "Renaissance 2010"
The Near North Career Metro High School building (above, at 1450 N. Larrabee St. adjacent to what used to be the Cabrini Green housing projects) has been vacant as a high school for the better part of the 21st Century. Currently, the building is being used a little bit of the time each day by the Chicago Police Department, and at day's end by Jones College Prep High School (for parts of the Jones sports programs). The Near North building could easily serve both the Ogden High School and Alcott High School needs, but the Chicago Board of Education doesn't even let the public know the building exists. Above: the northeast corner of the Near North building, showing the athletic fields behind the school. The Carpenter elementary school building (see photo below) is only two stories high and does not have any athletic facilities for a high school program. Substance photo by George N. Schmidt.Since Michael Scott joined Arne Duncan at the head of the Chicago Public Schools system in July 2001, the facts have never stood in the way of policies designed to privatize as much of public education in Chicago as possible, or to promote untested novelty approaches to schools in opposition to proven public education. That facts never got in the way. One fact in the way of the destruction of Carpenter Elementary School and its replacement by a boutique "high school" in a building designed to be an elementary school is that the Chicago Board of Education has an entire high school building -- vacant -- a mile from the current Ogden Elementary School. The distance from Ogden to the Near North Career Magnet High School building is roughly half the distance from Ogden to Carpenter. Given these facts, there is simply no sane policy reason for the Chicago Board of Education to (a) destroy an elementary school that is doing well, and (b) spend between $5 million and $15 million to "convert" an adequate elementary school building into an inadequate high school building, so that (c) a true high school building can be held in reserve until friends of the mayor's family can be ready to put a charter school inside the current space. But the drive to create novelty boutique schools, combined with what more and more people are charging is the Board of Education's policy of catering to the racism of many along the city's expensive lakefront, have combined to create "Ogden High School" and destroy Carpenter Elementary School. Surrounded by the high rise condominiums of Chicago's "Gold Coast," Ogden Elementary School (above) sits at 24W. Walton St., roughly at the corner of State and Oak streets in one of the wealthiest communities in the United States. The decision to create an "Ogden High School" was never seriously debated by the Chicago Board of Education. Ogden is 1.1 miles from the Near North high school building, but more than two miles from Carpenter Elementary School, which is being destroyed in order to make way for "Ogden High." Substance photo by George N. Schmidt.At its February 25, 2009, meeting, the Chicago Board of Education voted to destroy Carpenter Elementary School despite the fact that the school has been operating successfully as it became smaller, and the school is fully utilizing its space. This is nothing new. The novelty comes when the Board of Education announces, as it has, that the Carpenter building will become a "high school." The creation of mini-boutique high schools in Chicago has become something of a trend the past couple of years, but there has been absolutely no public debate over the cost or wisdom of doing so. The Chicago Board of Education has simply rubber stamped proposals from its executives, and the schools happen. Cost is never included in the original proposals, and there has been no public discussion of the long-term costs of such programs. Since the Duncan and Scott administration's began creating mini-high schools, enormous costs and irrational decisions have never stopped the Chicago Board of Education. 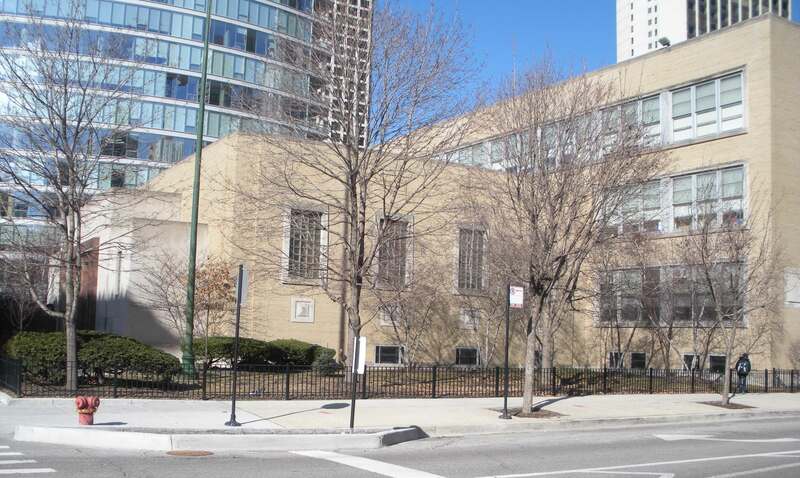 If the Daley administration wants to take a two story elementary school and convert it into a "high school", that is what will happen in Chicago, even at the same time the Board of Education is claiming it is facing a "$475 million deficit." One of the things that Scott won't be able to do is use his standard line that parents "don't understand" why the Chicago Board of Education has to destroy "failing" schools in order to save them. For more than six years, Scott has invoked this disrespectful attitude towards parents who overwhelmingly have rejected the Board's attacks on the city's inner city elementary and high schools. Carpenter Elementary School sits at 1250 W. Erie, a gentrifying area where developers are trying to evict the remaining community residents, some of whose families have lived in the community and attended Carpenter for three generations. 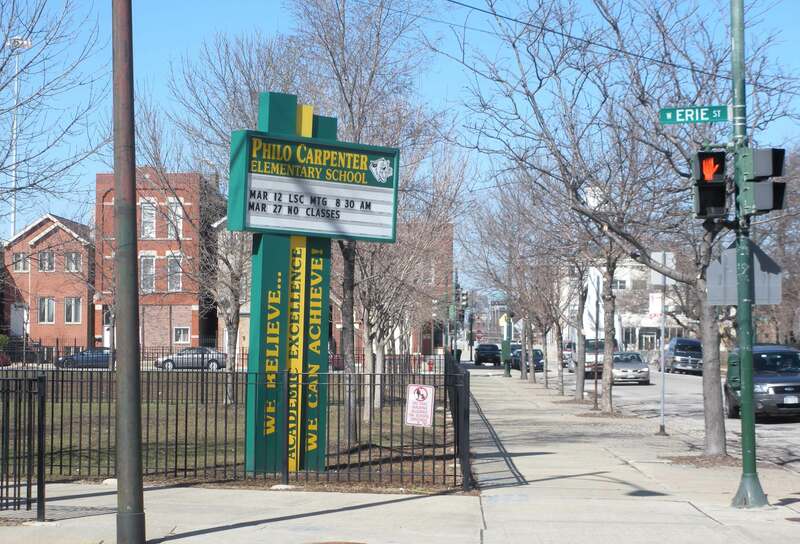 The Carpenter building, two stories high, is supposed to become a "high school" when the current elementary school is destroyed by CPS. But CPS has left out of the narrative the fact that it will cost between $5 million and $15 million to convert the elementary school building into a "high schools" -- and even then the building will not be able to provide most of the high school facilities currently possible in the Near North building. Substance photo by George N. Schmidt.Carpenter is not "failing" by any of the mindless test score measures utilized by members of the seven-member Chicago Board of Education when they want to close, slander, and privatize additional public elementary and high schools. The Near North high school gym (above) is only used on a few days per week, and then only after regular school hours. 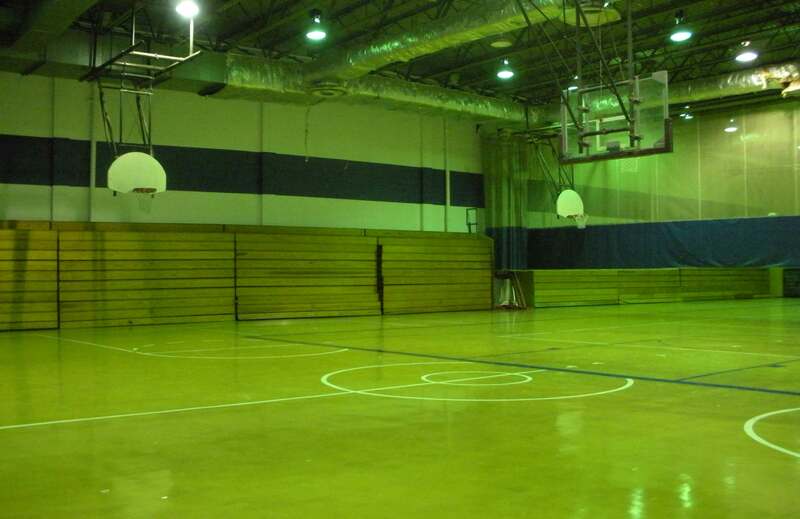 During the regular school day, the gym is vacant unless Chicago police officers, who are sometimes in the building for special training, play pick up games in the gym. After regular school hours, the gym is sometimes used by sports programs from Jones College Prep High School, on the south end of the Loop, three miles away. While Board of Education members have announced a $475 million "deficit" for the 2009-2010 school year, the public has never received an explanation of why Chicago has allowed the Near North high school building to go unused as a high school. Nor has anyone explained the huge cost that will come if the Carpenter Elementary School building two miles away has to be converted into a "high school." Substance photo by George N. Schmidt.One of Scott's reasons for meeting with the Carpenter parents is that he wants to defuse the overwhelming opposition to the destruction of Carpenter that has been growing since the Board first announced the strange plan in January 2009. Scott prides himself on being able to delay or divide protests against the Daley administration's plans to privatize and radically change the public schools, and he has been doing so since 2003, when he teamed up with Arne Duncan and Alderman Ed Smith to destroy Lucy Flower Vocational High School on the West Side. Any argument is used by Chicago officials as long as it furthers the cause of gentrification, privatization, and charterization. A goose family currently enjoys Lake Near North. The habitat also includes families of geese, other waterfowl, and wetlands grasses. CPS hasn't yet tried to deny Near North use as a high school because it is now a habitat for endangered species, but in Chicago anything is possible. Substance photo by George N. Schmidt.Since the manipulation of Lucy Flower high school (over four years, the school's staff kept being told to do a new improved new plan, only to have the plan rejected on technicalities), Scott has been at the center of most divide and conquer approaches to inner city schools, including the 2004 attacks on Austin and Calumet high schools that formed the beginning of the privatization and charterization of a growing number of the city's high schools. Scott's role in the destruction of Austin and Calumet is a matter of record that has already been reported extensively in the pages of Substance. Despite the fact that nobody from Carpenter has spoken in favor of the current destruction of Carpenter and the fact that it makes no sense for Carpenter to be changed into a high school, Scott is expected to do his best to divide the community on the afternoon of March 19, when he meets with parents. A big problem for Scott is keeping the parents from Carpenter from noticing that CPS has a perfectly good high school waiting a mile away -- and unused. The Near North Career High School building is the logical choice to house the new "high schools" CPS is planning for both the Alcott and Ogden elementary schools. In both cases, the Duncan administration gave in to local community pressures to create mini-high schools when parents objected to their children attending the local community high schools. I think Mr. Schmidt is correct to shine a light on the Near North Career Metro High building, but the rest of the article is a red herring. 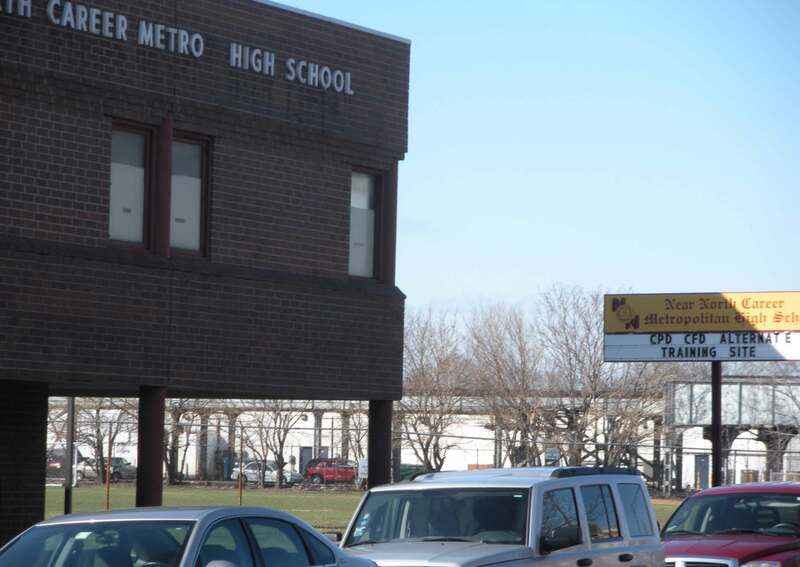 The reason Ogden International High School is taking over Carpenter is because CPS has other plans for Metro. Has the location of the Performing Arts High School been announced yet? Another gifted High School in the works? Another charter High School? Mr. Scott & Co. may be callous and uncaring, but they are not dumb. You're probably right about that Fine Arts thingy going to go into the Near North building, especially since the clout behind the Fine Arts thingy goes all the way up to THE VERY TOP (more powerful even than the mayor; see "After School Matters" for details). My sources say that the performing arts "high school" has got the Near North building reserved, too. But nobody from CPS will return calls asking for a confirmation (or denial) on that. After the March 11 "HUGE BUDGET DEFICIT! SKY FALLING NOW!" press conference, I asked for interviews with Michael Scott and Ron Huberman. I called Monique Bond from Lake Near North while I was photographing the CPS geese and ducks on March 12, and she said Ron and Mike would get "right back" about Near North and other budgetary questions. One of the questions I'm going to ask is whether they are holding the Near North building for the "Fine Arts" charter high schools -- a Maggie Daley project, I hear. It's also relevant how long the holding will continue. For all we know, they will name the place "Block 37" or "After $chool Really Really Matter$ High $chool." But that's still unconfirmed, too. But so far it's been nine days and I'm still waiting for "right back." It's a family of geese, not a duck family. Thanks. I've corrected the caption.